WordPress 5 will come with a new editor called »Gutenberg«, which is completely different from the current TinyMCE. That does not only mean change for the users, but also for theme developers, who want to modify editor styles, so it looks like in the frontend. This post shows you how that works for the new editor. With that, it is not that difficult to implement the basic styles of the theme into TinyMCE. So much for the starting point. 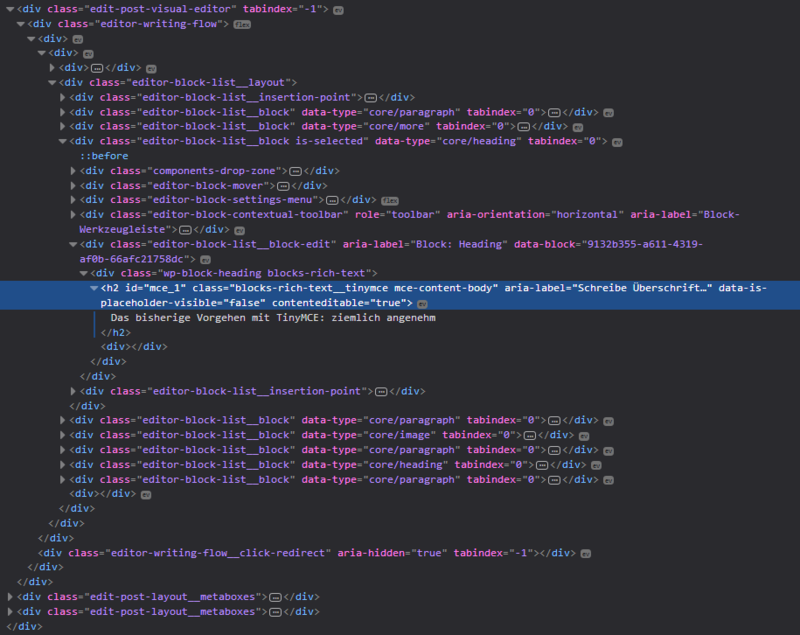 But before we can start writing the CSS rules, let us begin loading the stylesheet. Helpful for me was the article »How to add WordPress Theme Styles to Gutenberg« by Rich Tabor. We hook a function to the enqueue_block_editor_assets hook and add the stylesheet via wp_enqueue_style. Now to the CSS rules. Gutenberg comes with styles we need to overwrite. We can use .edit-post-visual-editor as the wrapper for the content, the blocks itself have the .editor-block-list__block class. .mce-content-body – used for many text block elements, like headings, paragraphs (but not the ones inside of blockquote elements), lists, and so on. 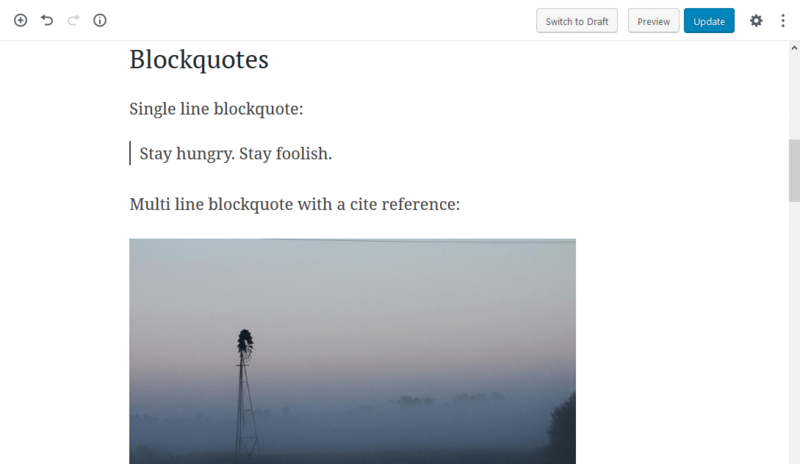 .wp-block-quote – a class for block quotes. .editor-block-list__block-edit – wrapper inside of .editor-block-list__block for the content element. First, I reset some styles of Gutenberg and define my base styles, like font and line height. After that, I define styles for the block elements and in the end for the inline elements, that live inside .mce-content-body (currently, that are just links in my stylesheet). An unresolved problem for me is to define the spacing between elements in Gutenberg. If we want, for example, give the headings space to the top, the inline toolbar would float far away from the actual text. I am quite happy with that for now. Like you can see, writing editor styles for Gutenberg is a little bit of trying and not made quickly. What you should avoid is: just take the styles for TinyMCE, copy them and think it will work. That could break the styles of the editor. I gave the instructions a try and it did not work. Adding your styles as .css produced some errors. Perhaps this is not meant for someone who does not understand how use sass for creating styles, or maybe you could include more complete explanation. I appreciate that you are one of the few trying to alleviate some of the ui issues with Gutenberg. thanks for your comment. Yes, adding that content simply as a CSS file will not work, you would need the import files and compile it to CSS. Since I published the post some things has changed regarding the editor styles, I will need to update the post accordingly. I will set that on my list and try to explain it more detailed then.